It was wonderful to have you participate in my Magic, Moxie & Mastery workshop at Be the LOVE Yoga Studio. We had such a diverse group of women in the room and I really liked seeing each of you explore what makes you unique as it relates to understanding your personal brand. During our 2 hours together we collectively created our Stop Doing List to actively make room for new possibilities, we turned inwards and learned a bit about what makes us different and unique, and we created our Personal Brand Anthems, all with an eye for understanding how to fully show up as powerful, confident women in our work and life situations. At the end of the workshop, I spoke about the How To Fascinate® personality assessment and wanted to provide you information about it and details to take it. See below for a special promotion of $10 off the retail price of $55. This is a limited time offer. Also, for those attendees who want to apply Fascination to their business brand, there is a link at the end of this page to take the Business Brand Test. To your personal and professional success! Your personality has one primary Advantage. It’s how you add value. It’s what makes you different and better. Think of it like a natural superpower for your personality. When you communicate using this Advantage, you earn more attention, and more revenue. With just 28 short questions, the Fascination Personality Test will identify your primary Advantage, and reveal your personality Archetype. 3. If you experience any technical hiccups please reach out via email at hello@robynmather.com or phone at 781-285-8801. This area is still in beta and is based on the book FASCINATE- HOW TO MAKE YOUR BRAND IMPOSSIBLE TO RESIST. The test is free to take. 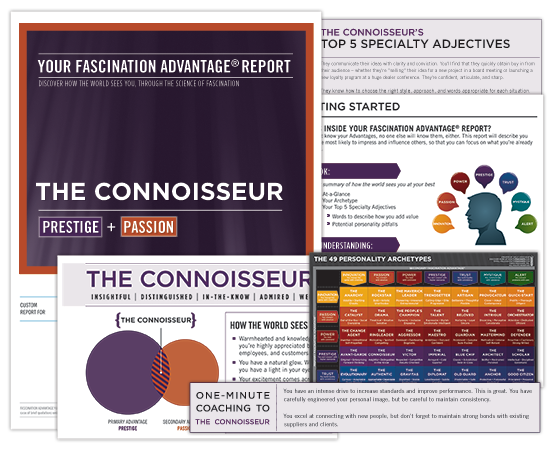 Based on over a decade of research, the How To Fascinate system has been tested on over 1 million professionals and delivered to organizations such as Twitter, Starbucks, GE and Intel. Creator, Sally Hogshead, studied the communication patterns inside dozens of world-class teams, hundreds of small business, and thousands of high-performing individuals and even commissioned a study with the Kelton Research Group to understand ways in which fascination can be a shortcut to persuasion, and the ROI of making a brand, or your personality, more fascinating. Robyn Mather is the founder of A Social State of Mind, a boutique communications company offering personal and business brand development for emerging and established women business leaders. Her eclectic career path once viewed as a blemish towards future success, is now her greatest source of power and insights as she guides others in developing their distinct brand of persuasion so they become the sought after business leader they know is possible. In 2017, Robyn became a Certified Fascinate Advisor and expanded her service offerings to include workshops and training to help businesses build better teams and improve individual employee performances.